HONG KONG—Police began moving in Tuesday morning to clear out metal barricades, tents, and protesters from a section of road outside a shopping mall and office building near Hong Kong’s government complex, executing orders the High Court handed down recently. But they were quickly stymied by pro-democracy protesters and their lawyer, former legislator Albert Ho. He successfully argued that the injunction should not extend to the whole area as originally anticipated. The operation is the first time in weeks that the Hong Kong government has moved against the pro-democracy activists, as the standoff over the right for Hong Kong people to freely elect their leaders enters its eighth week. But within 10 minutes, dozens of masked young men, some wearing hooded sweatshirts, appeared and began rigging together metal barricades in an attempt to hold the road. So even as police removed obstructions just a dozen feet away, protesters put more in place. After a long verbal standoff, protesters shifted their barricades back by a few feet. They allowed others obstructing Long Wui Road, outside CITIC Tower, to be removed entirely. By midday, the authorities had gained perhaps 30 feet additional space. A lawyer with CITIC Tower came out to announce that they would be content with this temporary solution while going back to carefully study the legal order. A confrontation may still take place in Admiralty, the protesters’ main occupied zone in Hong Kong, on short notice. Public attitudes generally favor the protesters leaving, but student leaders have said that without concessions from the government, they’re loathe to do so. 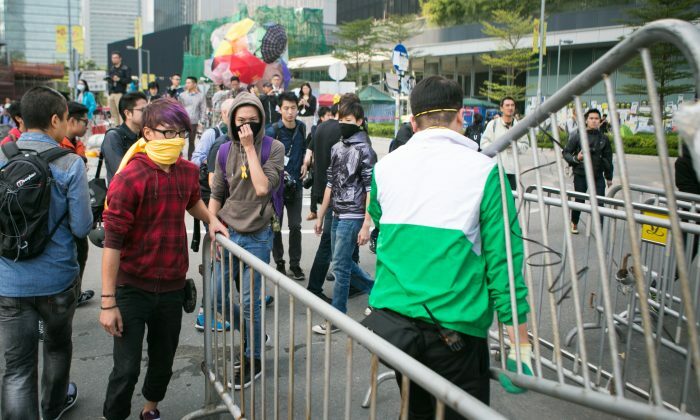 The individuals setting up more barricades near Tim Mei Avenue on Tuesday did not seem to be taking orders from either of the student groups headed by those leaders, though. The activists had not removed their tents, tables and chairs, and other supplies the night before. Joshua Wong, one of the student leaders, seemed untroubled the evening before the clearance, sitting on the roadside, apparently playing on his smartphone. The areas of road that were supposed to be cleared run opposite to Hong Kong’s Legislative Council, and also CITIC Tower. Legal action was brought against the protesters by CITIC Tower, a 33-storey building on Tim Mei Avenue and Long Wui Road. CITIC Tower charged that its business was being negatively impacted by the protests, and sought a court injunction to clear the road. Defense lawyers for the occupiers argued that part of the road had already been cleared—a single lane, enough for vehicles to eek in and out of the underground parking lot. Their appeals were exhausted after more than a week, and last week the court had already ordered the clearance of the obstructions. By 10:30 a.m. on Tuesday, CITIC personnel were readying to start removing barricades outside CITIC Tower, but not on the more strategically important Tim Mei Avenue, which runs alongside the legislature. Gary Yeung, one of the lead volunteers at a supply center, said that he would not be surprised if there were a confrontation later in the day. Protesters have still not moved many of their tents and supplies from outside the CITIC parking lot on Tim Mei Avenue, and seem to have no intention of doing so. As 12:00 p.m. neared, there seemed to be some credence to the idea, as masked protesters, some dressed in black, began fortifying their barricades, preparing for the siege. After being denied entry into China, pro-democracy student protesters invite Premier Li Keqiang to Hong Kong. Hong Kong's high court has authorized police to help carry out injunctions against the protest site in Admiralty.